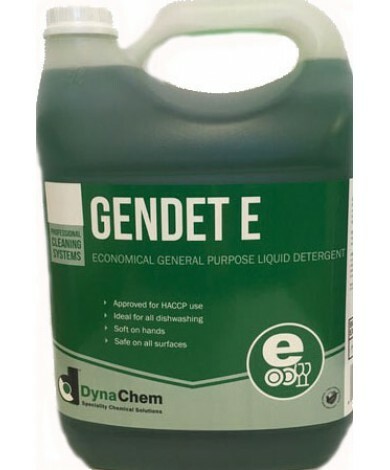 GENDET E is a neutral, foaming liquid hand-dishwashing detergent with excellent wetting properties and soil dispersion for use in food-handling applications. GENDET E is used for the manual cleaning of utensils, dishes, cutlery, crockery, food processing equipment, etc. GENDET E is non-perfumed and can be used safely on all food processing utensils and areas. Ideal for hotels, hospitals, homes, kitchens, food factories, institutions, etc. Directions for use: For manual cleaning use at a concentration of 1 – 5 ml per litre of warm water. In hard water areas or for heavy soiling an increased concentration is preferable. Rinsing after washing is recommended. For washing floors dilute 1 part GENDET E to 100 parts of water.